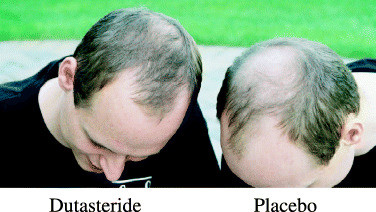 New study shows Dutasteride improves male pattern hair loss in identical twins. Dr. Dow Stough, a hair loss and hair transplant doctor in Arkansas, has just published a study in the Journal of Cosmetic Dermatology showing the effect dutasteride has on sets of identical twins. The object of the study was to compare the efficacy of dutasteride vs. a placebo in the treatment of male pattern hair loss (androgenetic alopecia) in 17 pairs of identical twin males with androgenetic alopecia over a 1-year period. The study was randomized and double-blinded meaning that neither the twins nor the doctors knew which twin got the dutasteride and which twin got the placebo. The twin that got the dutasteride received a 0.5mg/day dose for a period of 12 months. At the 6 month and 12 month mark the hair growth of the twins was evaluated using standardized clinical photographs, hair counts, and patient self-assessment questionnaires. The results of the studies showed that Dutasteride significantly improved hair growth at the 1-year mark compared to the placebo. The results were based on the analysis of the investigator assessment and the patient self-assessment questionnaires. Sixteen of 17 sets of twins completed the study, of which 15 sets correctly predicted the use of dutasteride. Only one set could not determine the active drug from the placebo. The clinical study proved that dutasteride significantly reduces hair loss progression in men with male pattern hair loss. OBJECTIVES: This study compared the efficacy of dutasteride vs. placebo in the treatment of male pattern hair loss (androgenetic alopecia) in 17 pairs of identical twin males with androgenetic alopecia over a 1-year period. METHODS: In this randomized, double-blind, placebo-controlled, single-center study, one twin from each identical twin pair received dutasteride 0.5 mg/day for 12 months while the other received placebo for 12 months. Hair growth was evaluated using standardized clinical photographs, hair counts, and patient self-assessment questionnaires. RESULT: Dutasteride significantly improved hair growth at 1-year compared to placebo based on the analysis of the investigator assessment and the patient self-assessment questionnaires. Sixteen of 17 sets of twins completed the study, of which 15 sets correctly predicted the use of dutasteride. Only one set could not determine the active drug from the placebo. CONCLUSION: Through the use of identical twins, this randomized trial provides evidence that dutasteride significantly reduces hair loss progression in men with male pattern hair loss.